We spent the second weekend of August in Savannah visiting my parents. We’d never visited Savannah mid-summer. It is very hot. And humid. The girls wilted quite a bit. They are usually really tough, which made it all the more surprising to see them just do not-so-great in the weather. We girls were taking a little walk with Nanahoney when M bent over and gasped like she was having an asthma attack. Nope. . . she was just hot. Our next visit is scheduled for the Savannah Book Festival in February, and that is much more our speed, weather-wise. But it was great for everyone to see each other, and we packed in plenty of fun and deliciousness, including a trip to the beach and to downtown Savannah and meals that included shrimp and grits, fried green tomatoes, barbecue and more food than people should eat on a daily basis. One new outing for us was a Bee Garden Tour at the Savannah Bee Company. We’re already huge fans of the store, where you can sample different varieties of honey, as well as their various bee-related, which we’re always excited to find in our local stores, like in the health-and-beauty-aid section at Target. So the girls were psyched to get a little more up-close and personal with the bees. Our bee educator showed us the hive that they have in the store (sort of like you’ll find at Indian Ladder and Riverview) and taught us quite a bit about the bees, their roles, how they communicate, and more. You can learn more about bees here. Of course, the coolest part was going out into the backyard to check out the bees. We all put on the beekeeper hoods to protect our faces, and those of us wearing sandals regretted it: Cute W stood still for quite a while with a couple of bees crawling over his toes, not wanting to move and accidentally squish somebody. 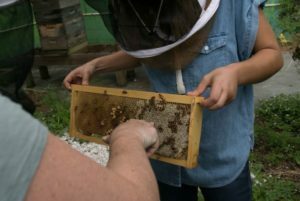 We also all got a chance to reach out and touch the hive to get a little finger-dab of honey to taste straight from the hive, which was pretty cool. Here’s me getting my honey! So that was very fun. The Savannah Bee people are a very friendly and enthusiastic bunch, and after the tour the grown-ups tried some mead while the girls sampled beauty products. And of course Nanahoney took the opportunity to do a little grandmotherly spoiling. The next day we went to the beach and everyone managed to get burned somewhere. Now that the girls are older, I’m not as vigilant with the sunscreen, and we were so out of practice that I made stupid mistakes, like slathering my legs with sunscreen before taking my shorts off, so I ended up with two flaming-red patched on my upper thighs. We are still peeling. On our last day we headed to downtown Savannah for a trolley tour, and while the guy was knowledgeable and entertaining, it was H-O-T again. We walked around a little bit afterwards and made a must-stop at Leopold’s Ice Cream, but we definitely weren’t in Awesome Tourist Mode with the heat. We were happy enough to shelter in the air conditioning and relax before heading home the next day.